United Way of Greater Cincinnati is constantly looking for new and innovative methods of advancing the common good and improving lives in our region. United Way affinity groups Women of Tocqueville (WoT, formerly Women’s Leadership Council) and Women Investing in the Next Generation (WINGs) were recently looking for a new project to get involved withand were able to latch on to one which perfectly aligned to innovation. In a meeting with Mary Adams of the Greater Cincinnati STEM Collaborative (GCSC), WoT and WINGs members were pitched the 3D Printer Club—where students design and print solid objects from digital files, as a means to introduce Tri-State students to STEM, an acronym for Science, Technology, Engineering and Math education. These interdisciplinary focus areas describe the skills and knowledge essential for student success. The club was modeled after GCSC’s successful STEM Bicycle Clubs, created with the purpose of “engaging students and sparking their interest in STEM education and careers,” according to Adams, the project manager of the clubs. Read the full story "EDUCATIONAL ENTHUSIASM STEMMING FROM THE THIRD DIMENSION," in the United Way of Greater Cincinnati News. olar 3D (Polar3d.com) announced today that it has completed the acquisition of STEAMtrax from 3D Systems (NYSE: DDD). Financial terms were not disclosed. STEAMtrax is an innovative STEAM-based curriculum that integrates engineering, CAD modeling and 3D printing technology with core academic knowledge in areas of science, math, language arts, social studies, and art. STEAMtrax curriculum is currently available for students in grades K-8, with high school curriculum to launch by August 2016. 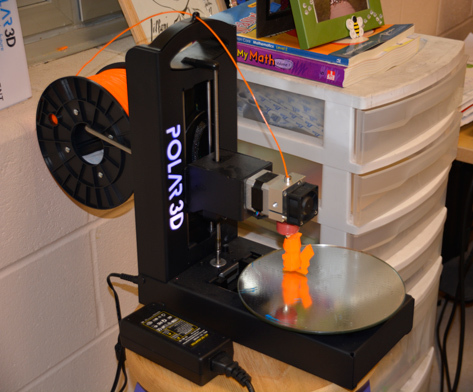 Thirteen new 3d Printer Clubs, where students design and print solid objects from digital files, will introduce several hundred fifth and sixth graders to STEM to fill a growing vacancy of jobs.